UPP founder, Luke McKenna is an educator and author who specialises in working with schools to build growth mindsets, grit, wellbeing and leadership for all students. Over the last 10 years, he has worked as a classroom teacher, middle leader and Assistant Principal. Luke has worked with educators and students across Australian Primary and Secondary schools from the Independent, Catholic and Public sectors. He holds degrees in Business and Education, a Masters of Educational Leadership, and a Professional Certificate in Positive Education. Luke has spoken at The Positive Schools Conference; Griffith University's Professional Development Network Conference; and ACU's Advisory Conferences in Canberra and Brisbane. His work has been published in the Australian Journal of Middle Schooling, Happy Schools and The Positive Times, and he is also the author of "Thrive: Unlocking the truth about student performance". He lives in Brisbane with his wife, Laura, and their 3 gorgeous kids. Over the last few years, Hogan has worked as the regional assistant for Marist youth ministry and as a member of the core team for Blind Eye, a local homeless and Indigenous outreach centre in Brisbane. Hogan has been a key part of the UPP team since 2015. He has since undertaken and completed a Diploma in Marketing Management. Hogan is currently undertaking his Bachelor of Business (part-time), along with his role as UPP Team Leader of marketing and design. In 2018, he completed the Discovering Positive Education course, run by Geelong Grammar’s Institute of Positive Education. Hogan is passionate about working with young people. Since 2012, he has worked with thousands of school groups and teachers sharing the message of students becoming their best. Hogan is getting married in 2019 and can't be more excited for the year to come. Pete served as college captain in 2012, and this experience cemented his passion for authentic leadership and challenging young people to be their best. He had the opportunity to do two years of youth work, in both Sydney and Canberra. He has since worked for two years alongside the student wellbeing team of Iona College, as a behaviour management coach, wellbeing coach and campus minister. This gave Pete the opportunity to lead, develop and run retreats, programs and camps, for young people from age 7, up to 30 years old. Pete has been a key member of the UPP team for 3 years. Since 2013, he has spoken and worked with over 55,000 students including school, university and church groups. In 2018, he has completed the Discovering Positive Education course, run by Geelong Grammar’s Institute of Positive Education. Pete now supervises UPP’s team of presenters and our program development. He looks forward to continually and deliberately growing himself and the team. Pete greatest joy was getting married in July 2018, to the love of his life. Over Pete’s time as a presenter, he has come to believe that you can’t change your past, but you can choose your future; and that each student should have the opportunity to be their best. Cody has a huge passion for helping young people. He is highly committed, and dedicated to improvement. In high school, at Iona College, Cody held the position of house captain and prefect. He is currently enrolled in a double degree in Business and Creative Industries at QUT, however has deferred to focus on his role at UPP. Since starting with UPP, at the start of 2017, Cody has worked with approximately 10,000 students, and continues to intentionally hone the craft of engaging young people in UPP incursions and workshops. 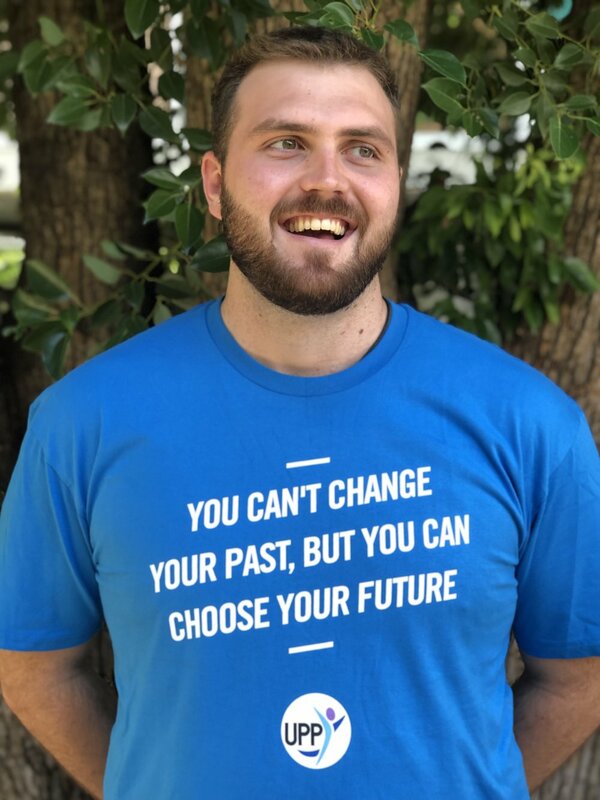 Cody has completed the Discovering Positive Education course, run by Geelong Grammar’s Institute of Positive Education and continues to develop his passion for helping students to learn, live and lead better. Drew has spent the last few years working as an English and History teacher in a high school in Melbourne. He has held roles as a curriculum leader in Humanities and most recently has spent time as the Year 10 Wellbeing Coordinator. Drew's biggest passion is student wellbeing. He loves to help young people realise their full potential and maintain positive wellbeing. Drew holds a Bachelor of Arts degree and a Postgraduate Diploma of Secondary Education from the Australian Catholic University. Drew grew up in Northern New South Wales and since leaving school has spent time living in Brisbane and now resides in Melbourne. Being part of our Melbourne-based team, Drew looks forward to working with schools and students to unleash each student's personal potential. Tom is committed to bringing out the best in the next generation. He spent 8 years volunteering as a Life Mentor with Hope Centre International journeying with teenagers from all walks of life. Since 2015 he has brought that experience and commitment into High Schools. Outside of his professional life, Tom is really enjoying the challenge and joy of loving his wife and raising his two kids. After graduating from high school, Beth volunteered in a 10 month program for NET ministries, Australia. This involved going into schools all over the country and running retreats with her team. She has a part time job as a Swimming Instructor where she enjoys working with young people and honing their skills in the pool. After NET and since starting with UPP in 2017, she has worked with approximately 9,000 students in Australia (not including the little ones in the pool). Bethany is studying a double degree at ACU, a Bachelor of Teaching / Bachelor of Exercise Science. She loves learning more and working with youth to show them how they can live at their best! UPP presenter, Lachlan Wilson, graduated from St Laurence’s College in 2012. Over the following three years, he worked in many different schools all over Australia, running leadership, peer pressure and sexuality retreats and leading youth ministry teams in Brisbane and Melbourne. Having worked with an estimated 10,000 students, Lachlan is motivated to help young people recognise and develop to their full potential. He is currently studying a Bachelor of Education (Primary) and looks forward to working with students as teacher in a school community. Tracey spent her early career in the world of administration, marketing and strategy within law firms in Australia (such as Clayton Utz and PricewaterhouseCoopers Legal), Europe and Asia. She has a passion for all things organisational and administrative and enjoys enabling the people she works with to excel at what they do best. Her aim is to provide the UPP team and school contacts with exceptional service and communication - with warmth and a smile. Tracey lives in Brisbane with her two high school-aged children, providing her with first-hand understanding of how UPP’s teachings and strategies can positively impact young lives.